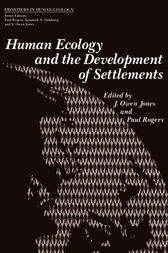 This book is the result of aseries of lectures organised by the Connnonwealth Human Ecology Council as aprelude to the Uni ted Nations Conference on Human Settlements, the HABITAT conference, which will take place in Vancouver, Canada, in May and June 1976. The lectures were given in London, England, during 1974 and 1975, most of them sponsored jointly with the Royal Connnonwealth Society. Four years ago, the Uni ted Nations Organisation was preparing for a major international conference concerned with problems of the human environment. This was the UN Conference on the Human Environment that took place in Stockholm, Sweden, in June 1972. It was the culmination of a rising interest in the study of these problems in many countries of the world. The study of environmental problems relating to human settlements was on the agenda at Stockholm, but because of the great breadth of the sub­ ject of the conference they could not be considered in any depth. This will be rectified in Vancouver; and already the study of human settlements and their problems is the focus of an intensive progrannne of activities throughout the world in preparation for the HABITAT meeting. The HABITAT conference is taking place at a time when it is recognised that human settlement problems are likely to increase greatly in severity in the remaining years of the twentieth century. We have entered aperiod of great uncertainty in matters of world development.